Thailand has officially opened its first halal hotel in Bangkok, which it hopes will attract more tourists following U.S. President Donald Trump’s immigration ban on seven mostly Muslim countries. The four-star hotel, called Al Meroz, offers facilities that serve the requirements of Muslim visitors, such as a praying room and halal food. The hotel has 242 rooms, currently used by tourists from Malaysia, Indonesia and the Gulf states. Earlier in January, Thailand’s tourism authority said the country might get more tourists from the Middle East as a result of U.S. President Donald Trump’s entry ban on people from seven mostly Muslim countries. 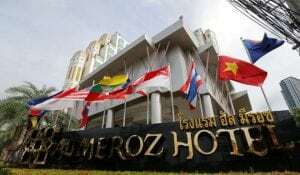 The hotel’s managing director Sanya Saengboon said he saw a business opportunity following the news. “One part of me is very delightful in the way of business is coming to Thailand and I don’t think it’s necessary to go to America. In fact, the people in one or two of those banned (countries) is a good friend of Thailand. We still expect a very good of visitor coming from that area,” said Sanya, referring to Iran. Only just over 2 percent of tourists visiting Thailand came from the Middle East in 2016, but that’s expected to rise by 8 percent in the first quarter of 2017. “That is also a growing market. For example, we are the number one medical hub for many of the Muslim countries and I think we will continue to do so,” said Kobkarn Wattanavrangkul, tourism and sports minister attending the opening. Muslims represent the second biggest religious group in Thailand, behind Buddhists, but make up only about 5 percent of the population.